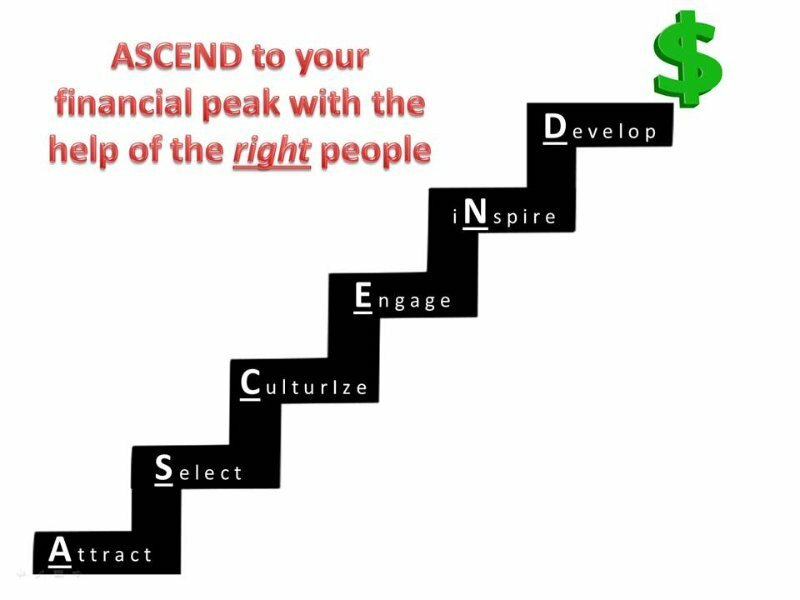 Climb the mountain to financial success with the right talent…DUH! This is one of those posts that when you read it you’ll say “duh” or “really?”…there’s a lot of them these days. My personal favorite is the “diet and exercise for better health” one. There are some others, like the 101 articles on what Millennials want out of work (they want what all of us want by the way). My humble post is going to be another no-brainer. It’s about your company’s talent…the people you have working for and with you. Chances are, you have an HR department or a contract recruiter who’s helping you find talent. If you’re lucky, you are finding lots of people through an internal referral program (that’s where the best people come from). For purposes of this post, when I refer to “the best” people I mean the people who have the best chance of having a positive impact on YOUR team’s/company’s performance (financial performance that is). The key to finding and keeping the best talent for your company is a suite of activities that you are already doing…you probably call it your “culture” or these behaviors are embedded (sometimes rather obscurely) in your mission/vision/values. They are what makes your company what it is. These are everything from your hard and fast rules about work (in your handbook or policies) to the unwritten rules of engagement like how late is too late and do you hit “reply all” on emails or be selective. Attracting talent to your organization is like marketing what YOUR COMPANY IS (we aren’t all Google) to those who will embrace it. Selecting is making a good hiring decision after a focused (behavioral based) interview process that looks for the competencies/skills/behaviors that will make YOUR COMPANY successful (again, this is about what works for YOUR COMPANY). Culturizing is just what it sounds like…orienting them completely into YOUR COMPANY’S unique culture. Engaging them is what everyone talks about in some of these “duh” posts. Getting their hearts and souls involved along with their bodies and minds. This requires a vision – best disseminated by the leader. iNspiring (apologies for the poetic license) is what you need to do EVERY DAY so that the talented, engaged people have a bigger purpose and vision to work for. Develop is what you need to do for yourself and for them. It will keep them (and you) going – and working at YOUR COMPANY – for a lot longer than if you don’t. I apologize for shouting the words YOUR COMPANY so often in that last section. It’s obvious to me that trying to be Google or Disney or anyone else that you aren’t will not work. Short term, you’ll attract people to your company but if it isn’t what you are, they’ll find out fast enough and vote with their feet. High turnover is a good indicator that you aren’t on track with your employment brand.